Rising percussionist and MC discusses how studying jazz has influenced his work as a hip-hop artist. MASHPEE, Mass. - April 4, 2018 - PRLog -- Since the introduction of the Walkman, to see a teenager with a pair of headphones or earbuds on is a common sight. We now have decades of parents complaining about the mind numbing effect of having music pumped into your ears all of the time as well as the isolating effect of personal listening devices. For musicians this activity is a form of studying as opposed to escapism. Such is the case with The ZYG 808. 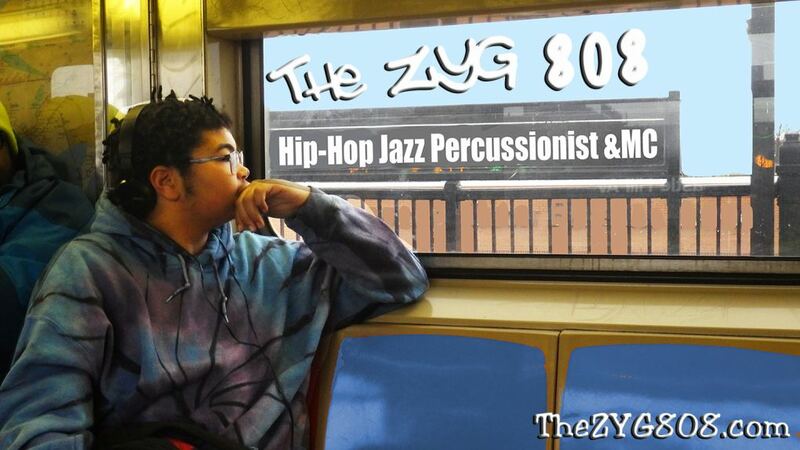 Sitting at the drums in the school band room, The ZYG 808 listens to a trap house beat for a few bars, pauses it and recreates the beat on the kit for about 48 bars before slipping into a Max Roach style jazz groove.From there he flows into an Afro-Latin groove for a few bars before slipping back into the trap beat, never losing the pocket. "Studying jazz definitely changes the way that you hear music," explains The ZYG 808, "it opens you up to possibilities. It's like almost all hip-hop is in a 4/4 beat, but I can hear where a 6/8 or even a 5/4 can fit into the pocket." "When he was about eleven I heard my Art Blakey CD blasting from the player in his room," explained his father, GroovaLottos keyboardist, Mwalim DaPhunkee Professor. "I then knew that the habit of raiding your parents record collection was now a family tradition. I used to borrow my mother's jazz and soul albums regularly. Horace Silver, Aretha Franklin, Jimmy Smith, Nina Simone, Ray Charles, Ahmad Jamal, Wilson Pickett..."
Currently in the studio making his debut album, "The Intro" The ZYG 808 is also i the planning stages for a jazz album, flexing his compositional muscle with original pieces in Afro-Cuban, Bebop, and Groove styles. The ZYG 808 will be the featured artist at AILI @ Haley House in Boston on May 17th.